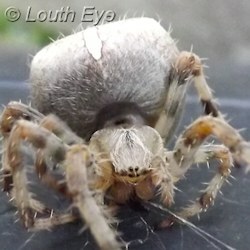 Now that it's autumn, the garden seems to be full of spiders that look like they could duke it out with foolish cats. And they're not the only ones spoiling for a scrap, as the fight for Lincolnshire's libraries reaches a milestone, and environmentalists prepare to take on an oil company for the sake of the Wolds countryside. The Save Lincolnshire Libraries campaign has come a long way since the initial outrage about flawed consultations back in July. I was in Lincoln on the afternoon of 30th September to witness Paul Stainthorpe handing over the last petitions to a council representative. No Conservative councillors were on hand to accept them, although I did spot Councillor Martin Hill giving an interview to the BBC in the council quad as I left. Paul Stainthorpe handed over an additional 4363 signatures for the general petition, plus 900 comments from the petition website, 62 signatures from people in Wainfleet opposed to the cuts in their area, some signatures from people opposed to the closure of Ermine library, and 80 more from people opposed to the cuts affecting Branston library. We were standing outside the county offices waving placards when a teacher, Nick Brown, from Priory LSST drove up. In his car he had a further 1500 consultation forms from children at that school, who had wanted to take the opportunity to comment on what was happening. He explained to me that this was something pupils at the school had asked to do of their own accord, rather than something the teachers had suggested. "The meeting was chaired by Donnington resident, Martin Scutt, who outlined the plans and voiced the concerns of many in the village about the risk of pollution of the Bain, lorry traffic, noise, lighting and an end to the beauty and tranquillity of their neighbourhood. Parish councillor Jackie Scutt complained that Egdon had made no attempt to inform Donington-on-Bain council of developments that would have a direct impact on the parish and this view was supported by district councillor Daniel Simpson who promised to take up the issue of the lack of consultation with the County Council. County Councillor Hugo Marfleet urged residents to send their objections to the County Council so that the planning committee would have a clear understanding of the strength of local opposition to the plan. Councillor Jill Makinson-Sanders spoke of her concern for the River Bain, one of the world�s rare chalk streams, with its invaluable but fragile ecology." "Biff Vernon, a local environmental campaigner, outlined the several local issues concerning oil production from this site, but also raised the wider concern of global warming. This was the same day that the IPCC reported that there was already enough oil and gas discovered to result in catastrophic global warming if it were all to be burnt, without searching for more oil in Lincolnshire. Another village resident, who declared he worked in the oil industry, pointed out that the plans were all about the money. Such a small oilfield would have a negligible effect on the country�s energy supply but bring a great deal of cash to the oil company." "Egdon Resources had been invited to attend the meeting but had declined, sending instead a pack of glossy brochures. The Managing Director, Mark Abbott, personally holds about three quarters of a million pounds worth of the company�s shares and would doubtless do well on a share price rise following the discovery of oil." "Two women, visiting from America urged us not to allow what has happened in their home areas of Texas and Pennsylvania to happen to Lincolnshire. They described how farmers had initially supported the oil and gas companies but now bitterly regretted their actions, their farmland destroyed by pollution. A resident of South Cockerington warned of their terrible experience with the gas flaring at the Keddington oil well near their home. Egdon plan to flare off the gas that comes with the oil at Biscathorpe rather than collect it. A couple of women came from Mablethorpe where their concern is the plans for underground coal gasification along the coast from Tetney to Anderby Creek." "There seemed to be only three people at the meeting who were broadly supportive of the oil well proposal, one of them, a farmer, declaring that he needed to be sure the electricity would come on in the morning. Some farmers, of course, have embraced the development of renewable energy by installing large arrays of solar panels on their farm building roofs or even on the ground, earning a good return from selling clean electricity." The online planning application includes 59 objections and 4 concerns raised, to date. People only have until the 4th of October to make representations about this application, and the county council aims to make a decision on it by late November. On a happier note, Aldi has submitted an application for a food store on Newbridge Hill, at the site of the Malt Kiln. The plans include 102 parking spaces, and a "proposed public realm", which looks a bit like a seating area at the north end of the site, with trees. There are always loads of trees dressing up planning applications, although whether or not they materialise is another matter. The pdf with the proposed plan kept crashing my browser, so look out for that. The 1st of October is Lincolnshire Day, in commemoration of the 1536 Lincolnshire Rising. Basically it was a bloody revolt against a grasping state, that ended largely in defeat and the executions of its ringleaders, so it's entirely appropriate to celebrate. In "these times of austerity", and all.